IPVanish is a U.S.-based VPN provider. While the location of this VPN is not very favorable, they say that they don't keep any user traffic logs (although they do keep some data). Also, when it comes to security, they have a number of offerings from a wide range of protocols (including OpenVPN), as well as military-grade AES 256-bit encryption. They also have live chat to help you with any issues you might face. IPVanish has apps for all major platforms. And for other non-major platforms, there are configuration files and instructions. They have fast speeds that will make your browsing experience more enjoyable. While IPVanish cannot unblock Netflix, with fast speeds and unlimited bandwidth, you're free to stream or download as many videos as you want. They have a large global network that will help you hide your IP address behind the server of your choice. And if you're not 100% happy with their services, you can get your money back within 7 days of signing up, no questions asked. IPVanish offers a number of options for customer support. They have live chat that's always available. Depending on your position in the queue, it can take from a few seconds to a couple of minutes for them to reply. Their replies are focused and clear and should resolve your issues promptly. The second option to connect with them is through email at [email protected] Their replies can take from a few hours to one business day. Another method to contact them is through the online form on their website. As with the email, you can expect the reply within a day. If you want to talk to them over their social media channels, you will find them on Facebook and Twitter. They are pretty responsive on social media and will reply to your messages within a business day. The fastest of all communication media is live chat. Need a quick answer? Chat with them in real time. The monthly cost for IPVanish is pretty average. Many VPN users usually want to go for longer-term plans, since they mean more savings. However, the longest plan by IPVanish is the 12-month, to go with their three-month and month-to-month plans. With no 2-year or 3-year plans, no other cost savings are offered. However, they often run a discount and if you visit them at the right time, you might find a 20%-off deal on the first subscription. Their payment methods are limited to just credit cards and PayPal. If you wanted to pay by Bitcoin, you'll need to look for other VPNs. There is a 7-day money back guarantee on their services. While it's shorter than the usual 30-day refund guarantee offered by some other providers, it does give you an option to try their services risk-free. Apart from the general VPN services, IPVanish also provides pre-configured routers that can just be plugged into and used without any installation or configuration. Why is that good to know? If you want to secure several devices that are connected to a router—perhaps you run a small office—a pre-configured VPN router is a good option. However, keep in mind that you'll still have to pay for the IPVanish subscription, even if you get their VPN router. IPVanish offers simple apps for a number of platforms such as Windows, Mac, Android, iOS, Linux, Windows phone, Fire TV, routers, and Chromebook. With its ability to run on so many platforms, you can easily secure all your devices with IPVanish. Their app offers several security features that are simple to use, even for novice VPN users. It's easy to customize the app according to your needs and stay secure as you connect to the internet. IPVanish's speeds are good, which makes it ideal for gaming, torrenting, and streaming. While it might not help you watch Netflix, it can help you download torrents of your favorite movies. As far as security, they offer the OpenVPN protocol, as well as AES 256-bit encryption, which will keep you protected not just from ISP spying, but also from hackers and other malicious entities. While IPVanish promises that it doesn't log your data, there has been an incident that proves otherwise. IPVanish received a warrant from the government regarding a customer's activity, and they complied, submitting the email address of the user, plus the date and time stamps when he logged into IPVanish. IPVanish has always claimed that they don't log user data, but this incident shows that they don't fulfill their promise completely and that they do keep a track of timestamps. IPVanish provides good speeds and high-grade encryption. They offer average prices, but they allow you to connect up to 10 devices simultaneously on one subscription plan (most other VPNs allow up to 5 devices). With 10 devices on a license, you could likely secure not only all the devices in your home, but also some devices of your friends. It's certainly a special feature. They provide the OpenVPN protocol and AES 256-bit encryption, which is enough to keep hackers and spies off your connection. With their high speeds, they're a good option for P2P and torrenting. However, if you plan to use a VPN for Netflix, this won't be the right choice for you, because IPVanish cannot unblock them. 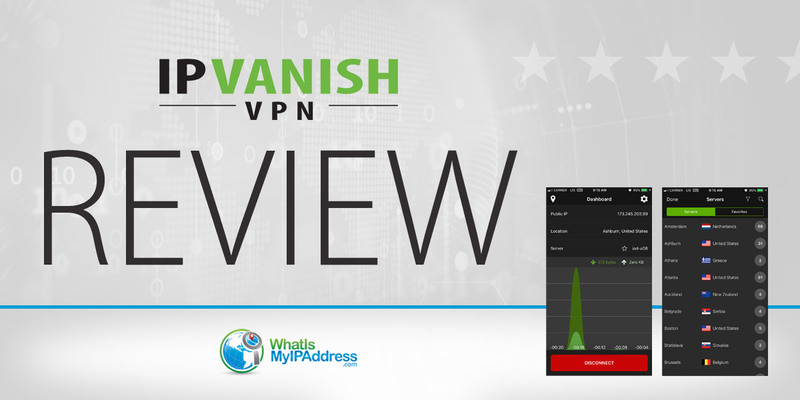 IPVanish offers VPN-configured routers for those who don't want to go through the process of installing or configuring VPN software on their devices. Their pre-configured routers are almost "plug-and-play." Their customer service is excellent and—depending on the communication medium you choose—you'll get a reply in a few seconds...or a few hours. While IPVanish is among the top VPN providers in the market and have a huge network, they are based in the U.S. and that's a somewhat negative factor because U.S. laws mandate companies to reveal user data when they are approached by government authorities. IPVanish has always claimed that they keep absolutely zero logs. However, in a recent case, it was revealed that they do keep a track of user timestamps. And while they don't store the visited URLs, timestamp logging proves that their zero-logs claim was false. Should you go for IPVanish? It depends on the level of privacy you want. If you are okay with the VPN company keeping partial logs (of timestamps), IPVanish can be a good choice. However, if you're looking for airtight privacy, you may want to look elsewhere.